"I'm 15 And My Hair Is Thinning!" "My hair strands are some what thick, but for a while they've been falling out which makes my hair thinner. My mom says it's because I always wash my hair constantly pulling out hair. By the way I haven't flat-ironed my hair in almost a year and my hair still doesn't look healthy or long like I wanted to. But I'm just focused on getting it thick. Any suggestions? First of all, know what is normal and what is not. The average head of hair has 100,000 to 150,000 strands. Losing up to 50 strands is normal, however, anything over that is not. 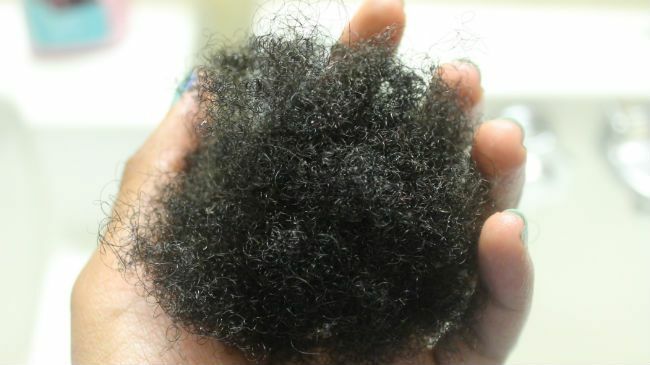 By nature, curly hair sheds more than straight hair. The Marcia Brady logic (the more times you brush, the softer your hair will be) doesn't work. Over brushing actually causes friction of the hair, promoting hair shed and breakage. For damaged, weakened, and brittle curls, stop brushing your hair and detangling with a comb. Try finger detangling instead. Add vitamins A, D, & E to your daily regimen. While it's important to note that there IS such thing as too much of these, it's also just as important to not neglect them completely from your diet or beauty routine. They both help regulate your hair cycle focusing on length and strength. The antioxidants in vitamin A moisturize the sebum in your scalp. Taking your daily dose of Vitamin E will also promote healthy hair growth, as it increases blood circulation and stimulates the hair follicles. Ask your mom to buy you cantaloupe, carrots, and dark green vegetables. She can also get a multivitamin (containing all of these vitamins in 1 capsule) that can be found at any grocery store in the wellness section. Don't dye, relax, or straighten. You mentioned that you no longer flat iron your hair, so we know heat isn't the culprit in this case. I'm not sure if you have experimented with harmful box dyes or relaxers. Right now your hair is in a super fragile state, so I'd suggest staying away from things like ammonia, lye, bleach and chlorine. Here's an easy, natural recipe to color and thicken your hair at the same time if you absolutely must color your hair. Hair shed at a young age can be due to an underlying health situation, like thyroid issues, anemia, alopecia, poor diet, or even genetics. Discuss with your mom if anyone in the family experienced hair loss at a young age, and that may help you understand where yours is coming from. Schedule an appointment to see your doctor.